The Granary is one of seventeen holiday cottages at Town Farm, on the edge of the Chilterns. We are a working arable farm, with some sheep over the surrounding hills, we are lucky to have views over to Ivinghoe Beacon on one side, and Aylesbury Vale on the other. All the cottages each have their own unique charm, and we also run a campsite during the summer months. The `Pick Your Own` opens in June and guests can take a picnic and stock up on fruit and vegetables - this is a five minute drive away. It is only a ten minute drive to Tring Railway Station, shops and facilities, or a ten minute walk to Ivinghoe village, with pub, shop and tea room. London Euston is a 40 minute train ride from Tring Station. The Granary is situated on the main courtyard, with an outside sitting area near the front door. The ground floor comprises an open plan sitting and dining room, with a separate kitchen. The sitting room has comfortable sofas, a flat screen TV and dining table with six chairs. The kitchen is fully equipped with cooker, microwave, fridge, freezer, dishwasher, washing machine and tumble dryer. Upstairs there are three bedrooms (one double, one twin and a single) and a family bathroom. The bathroom includes an over bath power shower. 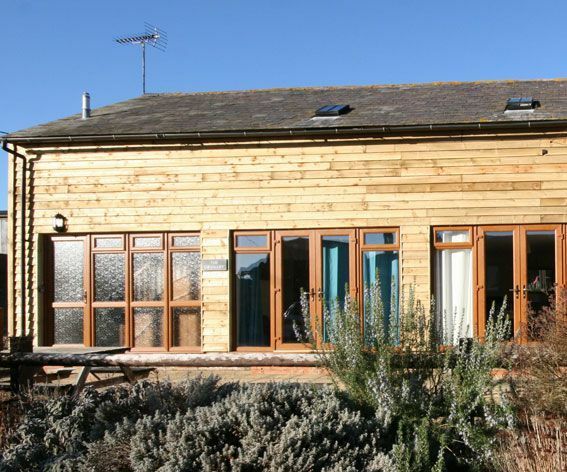 The property has access to a tennis court available to hire, games room and a children`s play area on the farm. The Granary is centrally heated by oil. Internet by Wifi is available and included in the rental. Parking for two cars is available at the front of the property. Up to two pets are welcome in the property, please let us know on booking. We request a refundable GBP100 damage deposit for stays of up to 27 days, and one week`s rental for stays of over 28 days. Please see our terms and conditions for further details. `We loved our stay at the Granary and the house was perfect, well equipped and laid out. We really enjoyed it.` - Gordon M.
I originally come from Cape Town, South Africa, and my home is now on the farm in Ivinghoe. My husband's family have owned Town Farm since the 1930's, it is an arable farm, with some sheep farming. Our brother in law also has a "Pick your own" just down the road, with everything from Asparagus in Spring, strawberries, and a long list of fresh vegetables throughout the summer into Autumn. We now have 17 cottages on site, which we started converting from barns in 1995. Many of our guests have enjoyed staying with us from all parts of the world and appreciate the beautiful countryside around us and there is always plenty to do. All our properties are comfortably furnished and offer all the convenience of your own home, all with fully equipped kitchens, some with dishwasher, washing machine and tumble dryer. Linen and towels are also provided, together with an information pack in the property, with a list of local activities and things to do. We love the area because you can be in the middle of the countryside one minute and hopping on the train for a 50 minute ride to London the next. The Chilterns offer a wide variety of activities, from National Trust properties, walking through the bluebell woodlands, driving through the picturesque "Midsomer" villages, to visiting Tring Zoological museum, swooping down the real snow in Milton Keynes Snozone, or playing Top Golf in Watford. All within 30/40 minutes of the farm. We are also close to the Grand Union Canal which stretches from London to Birmingham and which offers leisurely walks and boat hire. We are also only around an hour from Stratford on Avon, a little further to Oxford and Cambridge, and is a good basis for sightseeing. There is one family bathroom in the property, with a shower over the bath tub, toilet and basin. Town Farm is is in a good central location, with easy access to motorways and public transport. Although we are in the middle of the countryside, we are around a ten minute drive to Leighton Buzzard or Tring, both of which have shopping and railway stations. Aylesbury, Hemel Hempstead and Milton Keynes are also nearby. London is around 40 minutes by train from Tring, and there is a wealth of things to do in the area, from visiting National Trust properties, to wandering through beautiful bluebell woods and skiing in the Snozone in Milton Keynes! The Warner Bros Studio tour with the making of Harry Potter is only a 30 minute drive. We provide information folders in each property, with local supermarket locations, places to eat and visit. Linen, towels and wi-fi are included in the rental.